EAW051916 ENGLAND (1953). Bridge Street and the town centre, Andover, 1953. This image was marked by Aerofilms Ltd for photo editing. 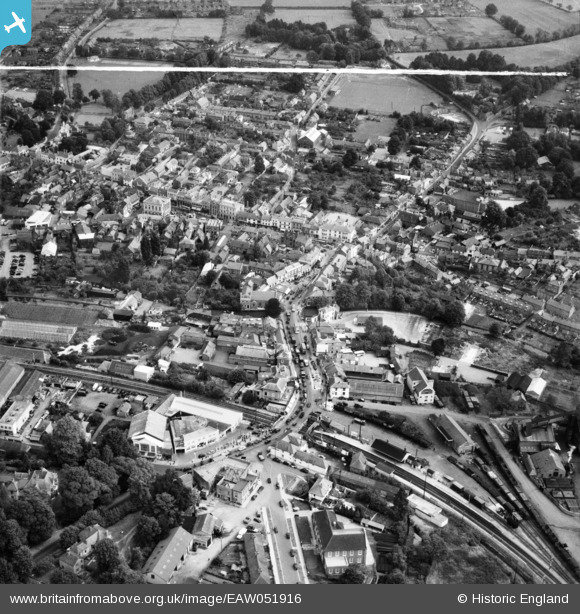 Title [EAW051916] Bridge Street and the town centre, Andover, 1953. This image was marked by Aerofilms Ltd for photo editing. Andover Town Station - as opposed to Andover Junction station that was on the main line to the north. This was on the Midland and South Western Joint Line from Andover to Romsey ... the most southerly section of the cross country route from Cheltenham. I remember standing a the railway crossing gates in about 1971 looking at the rusting rails of the derelict railway before the track had been lifted. In this picture we can see a lot of railway detail and perhaps someone might be prepared to take on the challenge of modelling this scene.